The Samsung 700Z5C is a silver 15.6" display notebook, running the latest Windows 8, and offering an Intel Core i5 3210M 2.5GHz processor together with a huge 8GB of RAM. A 1TB hard drive caters for the storage, operating at 5400rpm with 8GB express cache, and audio is provided by two 2W speakers complete with subwoofer. Read on for more details on this notebook in our Samsung 700Z5C review. 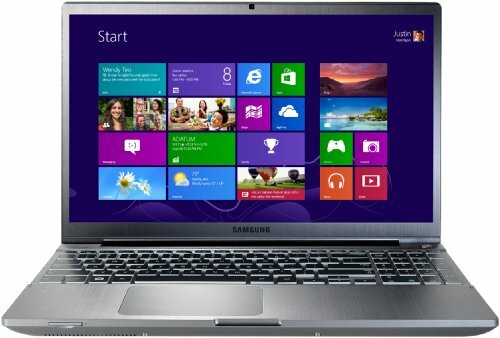 Below is our review of the Samsung 700Z5C, a 15.6" laptop, featuring 8GB RAM, 1TB hard drive and Windows 8. The 700Z5C from Samsung is a mid range laptop, with a competitive specification for the money. Featuring a clear 15.6" screen, with a resolution of 1600 pixels by 900 pixels, as well as 8GB of RAM, an Intel processor and Windows 8, it offers a lot of notebook for a relatively small sum - below we investigate this laptop in more detail. 1TB worth of storage is provided by an internal hard drive operating at 5400rpm - this is ample space for the majority of users, and ran fast during the testing period. The Intel Core i5-3210M fitted operates at 2.5GHz, and is a dual core processor which is based on the Ivy Bridge . The two (Dual) cores can provide up to four threads, due to Hyperlinking, thus leading to better usage of the CPU. As mentioned, each individual core offers a speed of 2.5GHz. This is further backed up by 8GB of RAM, which together helped to run Windows 8 at a decent speed - multi tasking across multiple applications was handled with ease. The "SuperBright HD+ LED" 15.6" screen provided decent visuals, with a crisp picture and bright and vibrant colours. Similarly the audio was pretty good for a notebook, with two 2 watt stereo speakers complete with sub-Woofer providing the sound output. The controls were, as per the rest of Samsung's range, comfortable to use - with a decent size keyboard spanning the width of the notebook, complete with number pad. Each key is fairly well spaced, to minimise typing errors, yet of reasonable enough size to make typing comfortable. The touch pad again offered easy control over the laptop, with browsing via this method feeling accurate, with none of our testers having any problems. In terms of connections, Samsung have provided you with a plethora of options: DVD, 2 x USB 3.0 ports, 1 x USB 2.0 port, a 4 in 1 card reader (catering for SD, SDHC, SDXC and also MMC), HDMI output, headphones and microphones, VGA (via an adapter) as well as RJ45 (Ethernet). In terms of dimensions, it measures 36.2cm by 23.9cm by 2.4cm and weighs in the region of 2.4kg, making this notebook light enough to be carried as part of the daily commute. Operating system duties are handled by Windows 8, which ran without issues during this test period. So overall what did we make of the 700Z5C? Fairly light, decent screen and specification. None to speak of, we liked this laptop. Overall a decent mid level notebook, providing ample computing power and storage for a relatively small sum of money.